Last year my husband and I visited our Canadian neighbors and spent a week in Vancouver, BC. 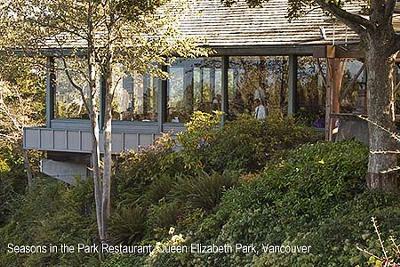 Queen Elizabeth Park was on our tour itinerary and we certainly enjoyed it. 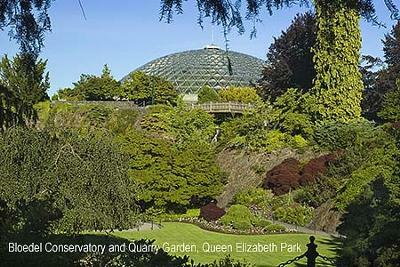 We didn't have enough time to go through Bloedel Conservatory which was disappointing. But we did have lunch at the Seasons Restaurant, a wonderful meal. What a beautiful view from the dining room! Vancouver was spread out below with downtown and English Bay in the distance. The bronze statues were a big hit and it is too bad we don't have any good pictures of them. They look just like real people! We are hoping to come back this fall and will have to visit the conservatory. I can imagine how beautiful the park will be with the fall colors. Thanks for letting us share our photos and story. Glenys' Reply Queen Elizabeth Park is one of the first places I used to hang out with my camera after I moved to Vancouver. 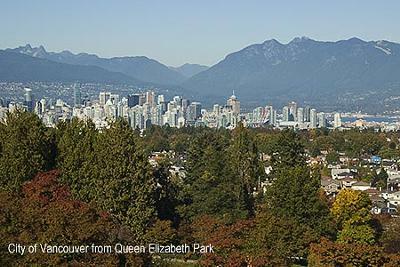 Your second picture is the highest spot in Vancouver city. Its a fabulous viewpoint and I know what you mean about the bronze statues looking just like real people. I have a few photos of a friend standing next to the fellow taking a picture and they look like they are best buddies! And the Seasons restaurant is a top class place to relax and eat. Food is terrific, especially the wild salmon - and since you're from Seattle, you know how delicious the west coast wild salmon is. Thanks so much for sharing your story and photos and feel free to send more after your trip in the fall. Get in touch with me before you come!